Menagerie Farm really started with the birth of our first half-bred Caspian, Menagerie Misty Morn' (aka Neffie) back in May of 1982. 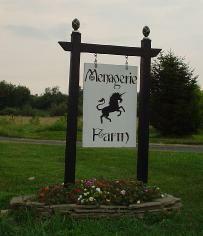 I'd decided while I was a senior in High school that I was going to name the farm in my future, Menagerie. That would also be the prefix I'd use for my ponies once I had my very own breeding program. I'd been enchanted with Caspians since I was a small child going with my aunt Peggy to Kathleen McCormick's Towner Farm in Great Falls, Virginia where she had *Jehan. *Jehan was the first Caspian exported from Iran in 1966. I can remember thinking he was the most beautiful pony I'd ever seen (and we had a farm full of ponies ourselves). When I started my own breeding program, I bred my Welsh crossbred mare, Sissy to *Jehan. Many years would pass until Jon and I would realize our dream of owning a purebred Caspian. We'd leased *Mehregan (UK) from Green Chimneys Farm in Brewster, NY for a couple of years and unfortunately after extensive testing, we were the ones to discover that he was in fact infertile. Jon and I bought Menagerie Ziba at the "Virginia Hunter & Sport Horse Fall Sale" in October 2004, the sale was put on by Professional Auction Services at Frying Pan Park in Herndon, VA. We went to the sale because we knew there were going to be two Caspian stallions for sale. 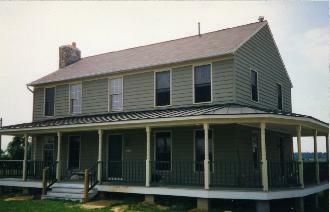 We couldn't imagine that we were going to be able to afford to buy one. We hadn't even brought a horse trailer with us! We had hoped that we'd get contact information from whoever bought the stallions so we could perhaps breed our mares to them in the future. Fortunately for us, no buyers at the sale had ever heard of Caspians, so prices were not what they should have been. Once we had a purebred Caspian stallion, then we just had to have some purebred Caspian mares to go with him. We contacted Nan and Don Scroggins because one of their Caspian mares, Southwest Anastasia reminded me a great deal of our half-bred mare, Neffie. We ended up not only buying Anastasia, but Millennium Casianne and Millennium Precious Present as well. Our goals are to produce quality, conformationally correct Caspians that will further promote the Caspian breed and also to promote Caspian part-breds as pony hunters for the show ring, for sport ponies and of course well loved companions.